Following the signing of the General Peace Agreement between the government of Mozambique and the Resistencia Nacional Mocambicana (RENAMO) in Rome on 4 October 1992, the United Nations was given the central role in implementing the accords. On 13 October the Security Council adopted resolution 782 (1992), by which it established the United Nations Operation in Mozambique (ONUMOZ). The four major areas of responsibility of ONUMOZ are: Political, Military, Electoral and Humanitarian. 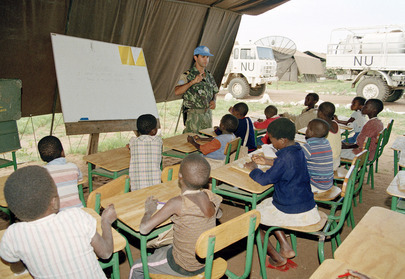 A Portuguese soldier teaching children in a classroom on the grounds of their camp.